Welcome to the world of pressure cooking. Your life just got a bit more awesome. No seriously I mean it. Pressure cookers really are that great! The pressure cooker is perfect for the way we live and eat today. We are busy Moms and Dads. We want to give our family healthy, homemade meals, but sometimes there jut isn't enough hours in the day. Want to know how I do it? You guessed it. I do it with a pressure cooker. Pressure cookers help to preserve flavors and nutrients, tenderize meats, and best of all, it can cook food three to ten times faster than ordinary cooking methods. Below I have recipes, tips, tricks, and basically everything you will need to get acquainted and excel at using a pressure cooker. Be prepared ladies and gents. Your pressure cooker will become you're new favorite cooking gadget. My pressure cooker is a Presto 01362 6-Quart Stainless Steel Pressure Cooker . It comes with an easy to follow booklet, which teaches you how to use the machine and cooking times for various items. This is where all my information is coming from today. All pressure cookers have a fill line. You can see it on the inside of the pot. Never go over the fill line. All my recipes are for a 4-qt pressure cooker. My pressure cooker came with a rack, which goes inside the pressure cooker. This is only used when steaming certain vegetables. Below I have put a star (*) next to items, which need to be cooked with the cooking rack. Always look through the vent pipe/pressure cooker nozzle to make certain that it is clear. Always do this before placing your lid on the cooker pot. 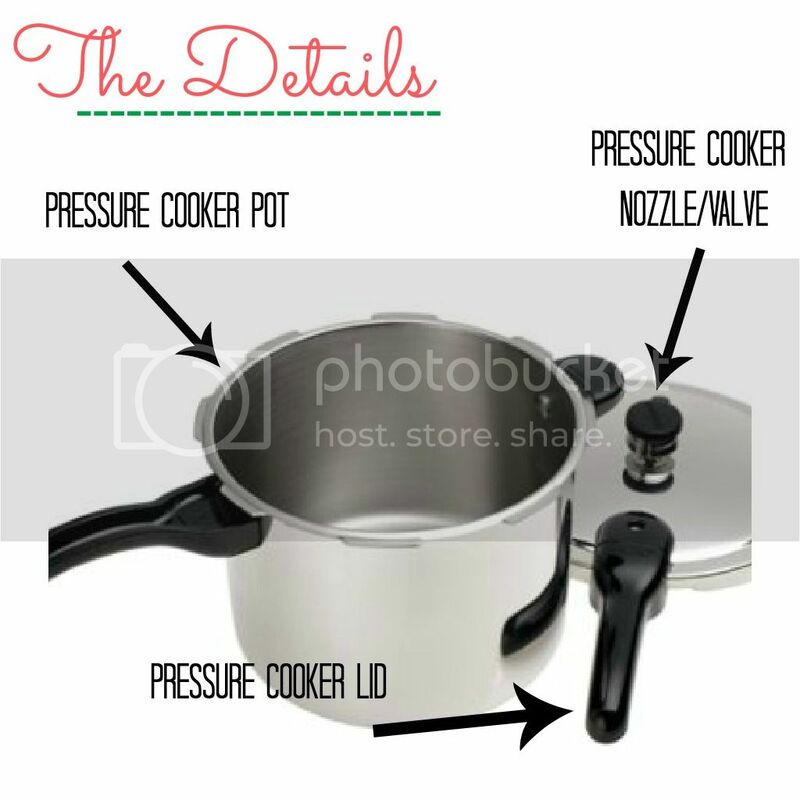 -If you are purchasing a pressure cooker from a thrift-store, make sure it comes with a pressure valve. This valve sits on the vent pipe. This is the round black nozzle that goes on the lid. You can see it in the picture above. This pressure regulator will fit loosely on your pot. It will not touch the top of the pressure cooker. -Always use a high heat setting on your stove, heat the pressure cooker until the pressure nozzle attains a gentle rocking motion. Once your pressure cooker nozzle/valve begins to rock, you begin your cooking timer. There are two ways to cool down your pressure cookers.You can "let the pressure cooker drop of its own accord", which means to set the cooker aside and do not open it until the pressure is completely reduced. Your air vent/ cover lock in the lid will pop down when the pressure is reduced. If the recipe says "cool cooker at once" then you cool the cooker by placing it in a pan of cold water and running cold water over it. I fill my sink up with a few inches of water and cool my cooker down this way. It cools in less than a minute. If your air vent/cover lock remains in its raised position, DO NOT open the cooker. The air venter/ cover lock is there to tell you there is still pressure in the cooker. You need to reduce the pressure completely before safely unlocking the lid. Here are a few safety tips. I know many are scared to use pressure cookers, but they really are not that scary at all. Just follow these guidelines and you will be peachy. I promise. -Always add cooking liquid. A pressure cooker needs liquid to work. If it is empty on a hot burner or if a cooker boils dry and is left on a heated burner, the cooker will over heat and can damage the cooker. -Always look through the vent pipe (where your nozzle/valve rests). Make sure it is clear. I usually blow air through before I use it. If this is blocked it will not function properly and can damage the cooker. -Always fully close your pressure cooker. If it is not fully closed than it can not build up pressure, meaning it cannot work. -Never open a pressure cooker when it contains pressure. The air vent/ cover lock provides a visual indication of pressure inside the cooker. When it is up, there is pressure. When it is down, there is no pressure in the cooker. When there is no more pressure, than you can safely open the cooker. If you open it when the pressure is built up than the contents of the cooker could explode, causing bodily harm. Here are cooking times for some grains, veggies, and meats. your nozzle begins to rock. Quick cool your pot. container. I do not pre-soak them. I do rinse my beans before cooking. 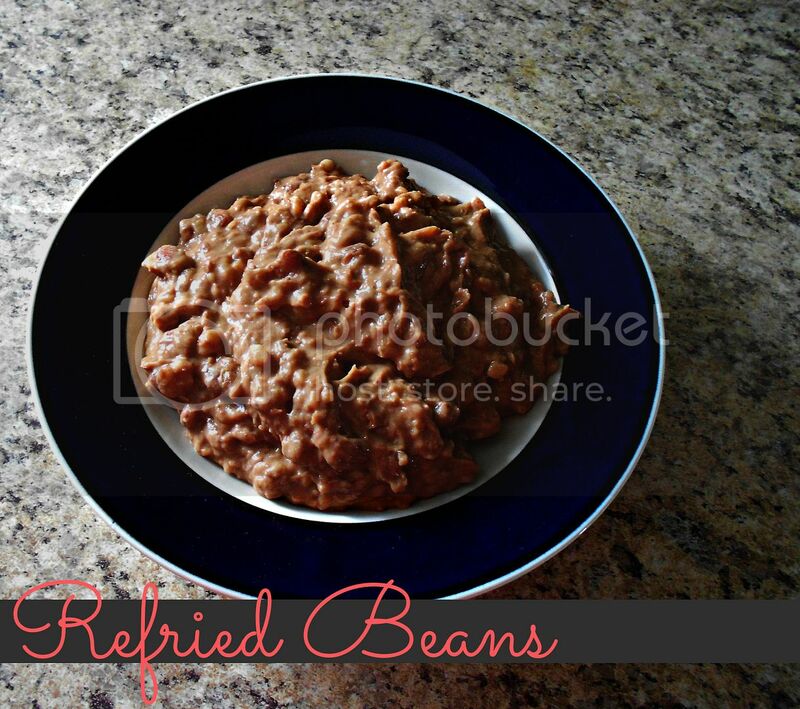 Find more Pressure Cooker Recipes Click HERE. I got a pressure cooker for Christmas 2 years ago, thinking I would use it all the time because my parents and grand-ma used it all the time. I've used it 3 times, to cook potatoes and asparagus, and it never came out right, so I just gave up. Really need to get more familiar with mine, every pressure cooker is different, though. Thanks for the little push to try again! I've got a Lagostina pressure cooker. This pressure cooker comes with a safety exhaust; if steam would build up too much, there's a space around the lid where the steam could escape. And there's also 2 different valves (the cap part) so there's 2 different pressures available (manual specifies which to use for what). And lastly, we've always cooled it down by simply running the tap water over the lid until the button pops down, making sure that water doesn't get in lock mechanism, and this takes about 15-20 seconds. Love...love love my pressure cooker! 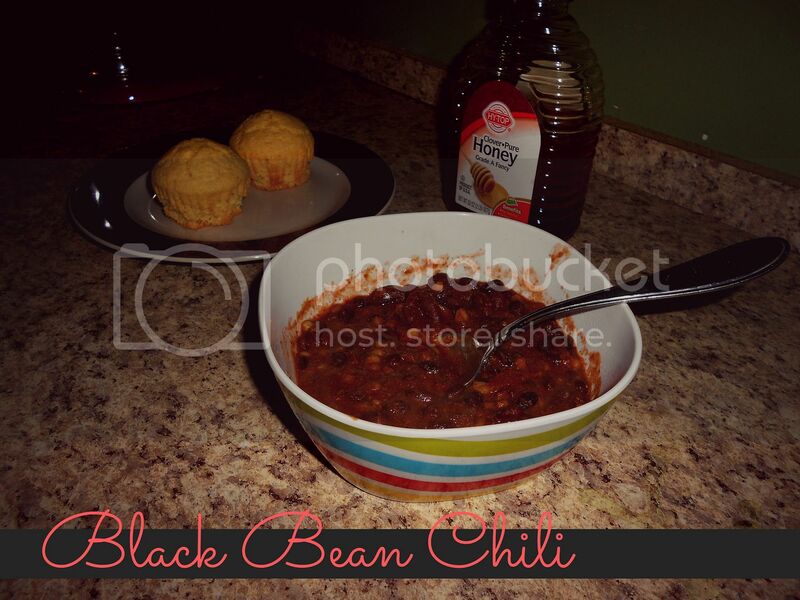 I have a digital pressure cooker and LOVE IT! No safety issues to worry about. In my family we use the pressure cooker for just about anything! It´s like having a slow cooker but the other way around! We make stews, cook beef, beans, soups, stock... pretty much whatever you can come up with! So yes, keep trying and I am sure you will come to love it!! Very nice tips. Will definitely check in often. I got an Electric Pressure Cooker for Christmas and I love it. Great for cooking beans and cheaper cuts of meat. I use it all the time. Will have to check out your recipes. Just found your site this morning. Have been clicking links and learning so much. I got a pressure cooker for Christmas. It is a large one as I wanted to start canning. My question is, since your recipes are for a smaller quart cooker, should I change the timing? Or how does that work. I mainly wanted it for canning and for cooking dried beans. But after seeing your list of things you cook, I'm getting all sorts of ideas! Hi there! If you have a large pressure cooker your cook time will be the same, but it will take a bit longer for it build up pressure. I have 2 pressure cookers for canning and thinking about getting a 3rd to speed things up.I put up 100s of jars a year it cuts that grocery bill down and taste great. Love my pressure cooker! I use it for so many different meals, don't think I could function without it! I buy whole pork loins when they're on sale. The first night, we have fried/grilled/broiled pork chops. The rest of the pork loin gets pressure cooked. Part of the pressure-cooked pork gets shredded and we have BBQ Pulled Pork sandwiches. The rest is used for pork n noodles, or added to a veggie soup. Whole chickens cook well in a pressure cooker too. When cooked long enough, all the meat falls right off the bones! Makes chicken and dumplings a breeze! Don't forget that frozen meats can go straight into the cooker too---no thawing out is necessary, saving even more time and money. Thanks for the tips on your page, they're great! If you happen upon the Cuisinart Electric pressure cooker from Costco (a steel at $60 a couple years ago) it rocks! You preset it and you don't have to babysit it until it's time to open or depressurize, and it beeps to let you know when it's done. I've been using a stovetop version for 40 years, and the electric is so much easier. Not only is it a pressure cooker, but it sautes, browns, and simmers as well. This is not a commercial for a certain brand...I just think this is a superior product that is much safer than the stovetop versions. I just subscribed to your site. Love LOVE my pressure cooker! I feel like it should have a retro revolution much like the crockpot has, if only people would realize how awesome they were, lol. I can in it, make beans, make seriously great Indian food in like three minutes... way to bring back the old school pressure cooker! Hi Danielle, Thank you for taking the time to share your inspiration. I think that there are a lot of people that would pay a fee to learn what you are sharing on this page. These are hard times for many (including myself) and to know that you are "doing it" gives us hope. "Below I have put a star (*) next to items, which need to be cooked with the cooking rack. then lower, "* Do not use rack; place in cooking liquid." I'm trying to decide between an electric PC or a stovetop one... Is there a difference besides the price and do you prefer one over the other? My grandmother had a stovetop PC when I was a child. I have vivid memories of being deathly afraid of it! Any advice would be greatly appreciated. Thank you! Just found your site. I love my pressure cooker. Thanks for sharing all these cook times. I need to try my hand at cooking more things in it. I have an electric 8qt pressure cooker and I love it. we use it a couple times a week . It is so easy to use. We make the best mac n cheese in it. Hi Danielle! I just saw you on the Today show! Loved it! I also live in Henderson, Nv and have been trying to cut costs. We are down to one income since I had a work injury and have been out of work due to surgeries. I'm glad I found your blog. It looks like you are doing a wonderful job! 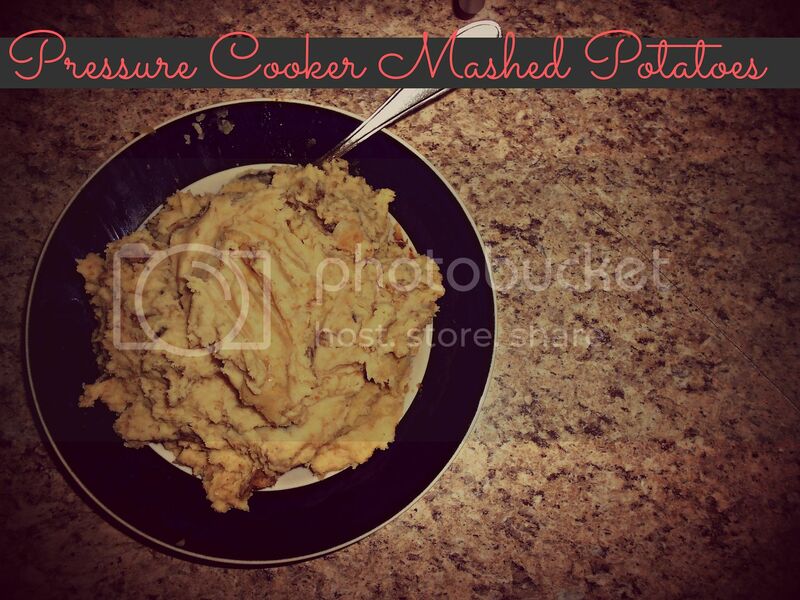 I love using my pressure cooker (I now have 2-8qt Presto cookers) for my family of 5. I often go to that Hispanic market near Lake Mead/Boulder HWY called Cuevas Meat Market. Super cheap meat specials, always looks fresh because that place is busy! I hope to use some of your recipes and deals if you post any. Good luck with everything! 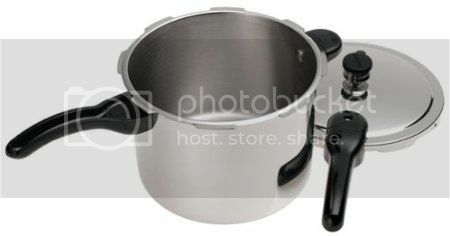 Hello, I am living in India and looking a aluminium pressure cooker that suits my kitchen requirement. Please suggest me which cookware brand I go for and please also suggest me should I choose hard anodized cooker or aluminium cookers. It would be a great help to me. Thanks in advance. I love using my pressure cooker/canner, especially for frozen meats, such as chicken. I love my pressure cooker/canner. I love to cook frozen meats such as whole chicken. I personally have an InstantPot IPLux60 and the cooking times you mentioned in this post will come in really handy. 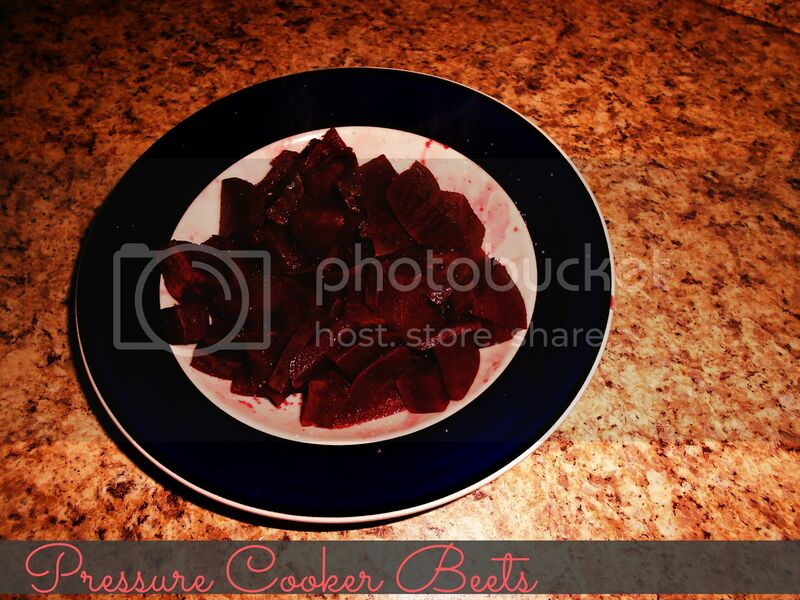 Thanks for sharing these and for giving me some ideas on what I can actually cook in the pressure cooker! Although I only recently bought a pressure cooker, I'm in love with it. It saves me time. I'm learning how to use it and trying out new recipes. At first I wasn't sure which one to buy and what to look for but I found http://www.cookwithpressure.com/ which really helped me. My only advice for new pressure cooker users is to do your research. Once you invest in one, you won't regret it. It makes cooking in the kitchen super fun!